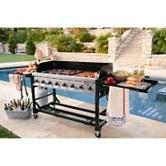 This grill powered by 2 propane tanks can take you from the average backyard griller to the Grill Meister!! Grill up an amazing assortment of hot dogs, hamburgers and request the griddle and you can add fajitas to the mix! This can be used for breakfast, lunch or dinner. You will be the most popular person at the event when you have this bad boy in your corner. Sitting on top of a table top on wheels, this grill also has two tables on either side for storage for any ingredients that are needed quickly. You cook we will clean! Order now! Spatula, 2 propane tanks, and food are not included. Propane tank rentals are available on this site!